We are supposed to be even more hardworking during Ramadhan. No time to be lazy, remember that! Hehe. (Yeah, I need to be reminded too). Tonight, I thought of sharing with you a little something. :D (*coughs* A little teaser at the end of this post). On 26th June 2014, I attended Nora Danish X Fashion Valet event at White Box Publika. It was a great collaboration and I loved the theme of the collection : Monochromatic Elegance. Rayqal came to support his mummy! Nora's number 1 fan. So stylo! Vivy Yusof of Fashion Valet & Nora Danish. An awesome collaboration! Well done ladies! With the star of the day, Nora Danish. 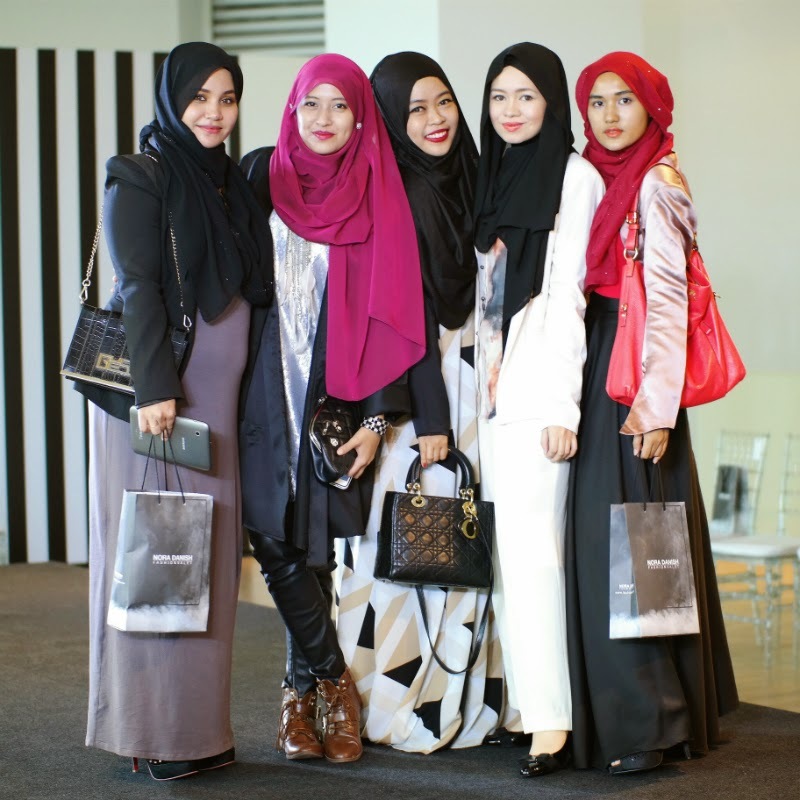 Blogger friends Shea Rasol and Aishah Amin, videographer Atiyah Saadon and Syahira Zakaria my SIL. She did this post during raya last year too! Haha. SIL Syahira Zakaria and cousins Cho Putri Azalea and Tengku Azura. One of my fav female photographers ever, Kim Leow. So happy to see you after so long! Last time she shot me was in Downy Mystique by FV at Black Box Publika and Timeless Classic : Nearing Eid Nostalgia. Spot me with the camera! Even though in the first year of my legal practice as a chambering student and as a lawyer I used to wear black and white every single weekday because I had to go to court almost daily, black and white still gets to me. Haha. "An ode to the concept of yin and yang, black and white is a representation of strength and softness, traits rotted deep in women everywhere." Below are some of my favourites from the Nora Danish X Fashion Valet collection. Family who came to support Nora :) Cuzzies and SIL. Captured this before the show started. My new colleague who is also a mutual friend of Cho my cuzzie. Just found out we were kindergarten mates!!! Phew, that's a whole lot of pictures for an event! Oh one more thing, the collection is affordable too as all the pieces are priced between RM180 - RM250. What are you waiting for, go line up ( virtually ) for Nora Danish X Fashion Valet before everything is sold out!